2009 CCACA conference, demonstration Large scale masks, Davis Ca. The twist of an individual’s imagination is one trait that accounts for our different perceptions of reality. As a child I would fall asleep seeing faces in the woodgrain wallpaper of my bedroom. Throughout my education artists who were unique in their approach to creating unusual and somewhat dark work inspired me. From the writings of Edger Allen Poe to early monster movies, I have always been interested in the things of Art and life that are mysterious and unusual. Heironymous Bosch’s and Giuseppi Archemboldo’s bizarre paintings, Leonardo Da Vinci’s grotesque faces and the bold expressions of Francisco Goya make it clear to me that “Art” does not have to be tame stuff. Later, I was attracted to the surrealists for their pulsing atmospheric landscapes and to Francis Bacon, for his gutsy emotionally twisted portraits. I became interested in psychology, the Rorschach inkblot test, caves, and Mauritz Escher’s reversals of space and form. 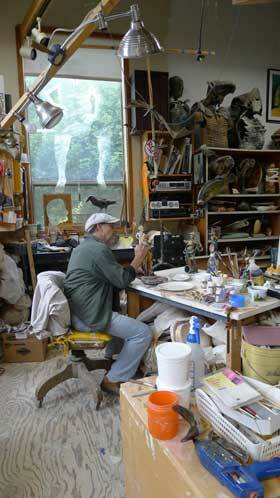 For the last 35 years, I have been teaching Art and producing ceramic sculpture in an abstracted figurative style. I work with graphite on paper for the directness of process while I love working with clay for its skinlike plasticity and pyromanic produced permanence. 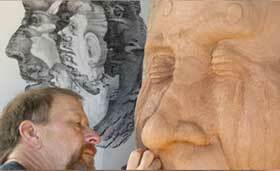 Abright was introduced to clay by Bruce Duke at San Joaquin Delta College in Stockton in the late 60's. He completed his graduate degree at San Francisco State in 1974 working with Bud McKee, Stephen De Staebler, Joe Hawley and David Kuraoka. 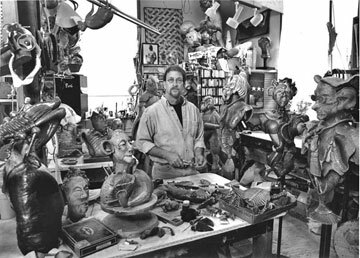 Abright has taught ceramics at the College of Marin in Kentfield, CA since 1975 and has been influential in the lives of many artists. He has exhibited throughout the U.S. and his work is in many private and museum collections.